My family love a green salad most days of the week. Most of the time it is with a simple dressing of extra virgin olive oil, vinegar and salt. This salad is my party version, as it has a few additional ingredients. I love the dressing in this salad. I love the creaminess the avocado brings to it. We had it with a barbecue the other day and it was lovely. The dressing can be made earlier, and kept refrigerated until needed. Make the dressing: Put the oil, vinegar, mustard, garlic, sugar, salt and pepper in a small screw top jar. Put the lid on a shake until the dressing is well blended. Check seasoning, add more if needed. Wash the salad leaves, drain in a colander or use a salad spinner to dry the leaves. Tear the leaves into smaller pieces. Cut the avocadoes into large slices, reserve 5 slices for garnishing. 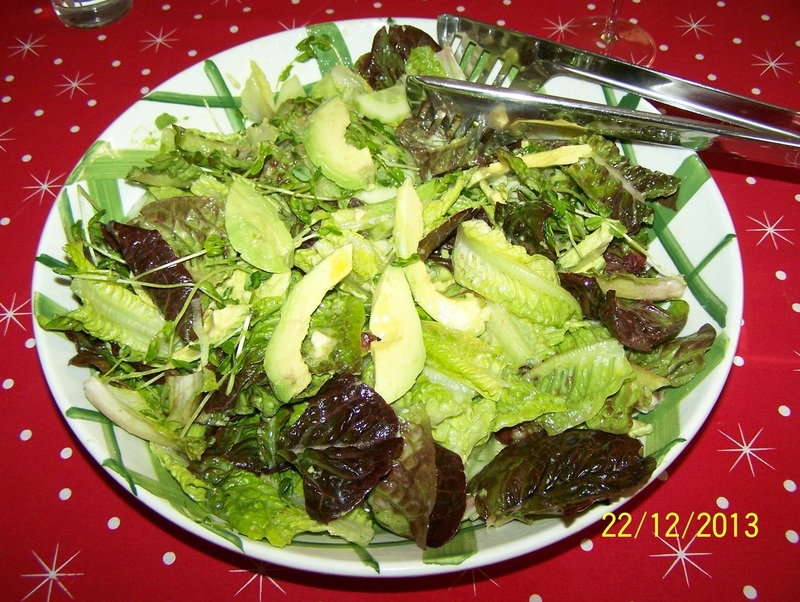 In a large flat salad bowl, put the lettuce, snow pea sprouts, avocado, spring onion and cucumber, toss gently to combine. Drizzle the dressing over the salad and serve with the reserved avocado slices. Serve immediately.